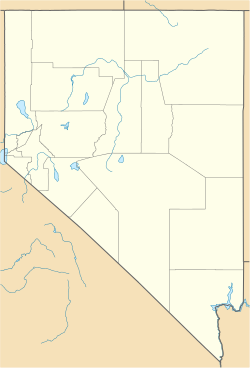 Silver City is a near ghost town and a small residential community in Lyon County, Nevada, USA, near the Lyon/Carson border. The population as of the 2000 census was 170. Silver City was established in 1859, named for the silver deposits discovered in the area near the Lyon/Carson border. Through this narrow gorge called Gold Canyon, above Devil's Gate, thousands of travelers passed on their way to the silver mines of the Comstock Lode. By 1861, the town had four hotels, multiple saloons and boarding houses, and a population of 1200. Silver city provided boarding facilities for animals used in hauling ore-laden wagons between the Comstock mining areas and mills on the Carson River. A foundry, the first iron works in Nevada was moved here from Johntown in 1862. The town was the site of the Comstock's first silver mill—Paul's Pioneer. During the 1870's, additional mills were built and by 1871, Silver City had eight mills with 95 stamps. The population began to decline after the Virginia and Truckee Railroad was completed in 1869. Construction workers left the area, taking their business with them. ^ Federal Writers' Project (1941). Origin of Place Names: Nevada (PDF). W.P.A. p. 48. ^ a b Paher, Stanley W (1970). 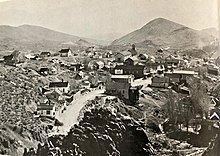 Nevada Ghost Towns and Mining Camps. 69: Howell North. Devils Gate and Silver City. Left photo is circa 1866; right photo is 2010. This page was last edited on 18 September 2018, at 13:49 (UTC).